When you selected your lovely wedding gown, you probably weren’t thinking of anything besides wearing it to on your wedding day to exchange your vows. But if you preserve the fabric properly, its beauty can be saved for future generations to enjoy. Once your wedding is over and the last thank you notes done, it’s time to enjoy your new married life and all it has to offer. But what about your wedding gown? If it’s stuck in the back of your closet with a mud-stained hem and icing smudges on the bodice, you may want to look into having it professionally cleaned and stored. This process will enable you to treasure your memento of this special time and can even make it possible for you to pass the dress down to your own daughter. If you wonder why you can’t just dry clean your wedding gown and stick it in your attic still in its plastic wrapper, there are some important things you should know. First, if there are any stains on your gown, the longer you wait to have it cleaned, the more permanently set they’re likely to become. The experts recommend having your gown cleaned and preserved within about six weeks of your event to ensure the best results. This is particularly important if you have any stains such as red wine and mud, which can be difficult to remove and the longer you wait, the harder it will be to do. However, even if your dress has been sitting in your closet for months or even years, if you suddenly decide you want to preserve it, it’s never too late to see what a professional can do for you. Some preservation companies are able to restore a gown even a generation or two after it’s been worn. The key, though, for success is that the fabric fiber remains strong. When you bring your gown to be preserved, a trained professional should look over the fabric and assess the condition and determine what needs to be done to clean it and prepare it for safe storage. 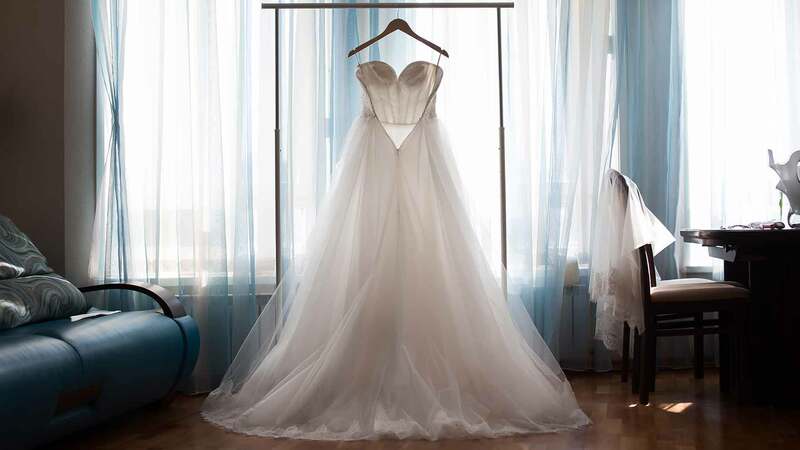 The type of material used for the gown, as well as any embroidery, beading and other special detailing all will effect what type of specialized process will be used to clean it. Once the cleaning is complete, it can either be wrapped and placed in a special archival box or specially hung for preservation. In either case, once you get the packaged/preserved gown back, it’s important to store it in a temperature-controlled environment away from heat, mold, insects and sunlight. (This usually rules out the basement and attic.) The best storage location choices are usually underneath a bed or in the corner of a closet. Many wedding planners suggest that you begin searching for someone you can trust to preserve your gown while you are still in the midst of planning your wedding. This way you will have this arranged in advance and can the cleaning and preservation process started as soon as possible after your honeymoon is over. There are many ways to find a wedding gown preservation company. You can ask for referrals through the bridal salon where you purchase your dress. If you use a wedding planner, he or she may also be able to recommend a service to do this for you. Other recent brides can be good sources of information as well. Or, you can ask your local dry cleaner if they do wedding gown preservation or know any companies that do a good job with this. In addition, you can do a search online. For instance, the Association of Wedding Gown Specialists offers a member directory you can search to find experts working in your area. You can also find some companies online that offer this service, such as Heritage Garment Preservation, J. Scheer & Co, and HouseofBrides.com. You’ll probably want to select a company that advertises “museum quality preservation” of wedding gowns. Just make sure they have a good reputation and have been in business for a long time. You can do a search online to see if any complaints have been filed. You can also ask to talk to former customers. You’ll want to know if the company does the preservation work in-house or whether they plan to ship your dress out. Also ask what type of guarantee they provide. Make sure they stand by their work and that they will compensate you for the gown’s full value is any damage occurs during the cleaning and preservation process. This is important to protect your investment, particularly is you have a very pricey gown. Before you bring your wedding dress in to be preserved, there are some things you can do on your own in advance to prepare the gown. First, be sure never to store it in plastic, since this can attract mold and mildew. It can also decompose, leaving a acidy residue on the fabric. Further, you should resist trying to remove any stains on your own. Finally, be sure not to store your dress on a metal or wooden hanger, since these can cause it to stretch and become misshapen. Your best bet is to bring a clean white sheet to your wedding location (just pre-wash the sheet first without detergent to be sure nothing is on it) and as soon as your reception is over, you can use the sheet to protect your dress until you get it to the cleaners. It’s important to note that there’s been much controversy in recent years around the concept of wedding dress preservation. This is because some companies make big claims about what they can accomplish, promising to preserve your dress in a special way, and charge big bulks for this service. However, most experts will tell you that there’s no secret to garment preservation. That being said, it is crucial that you hire someone for the task who is quite experienced and effective. It’s also worth pointing out that some gown preservation companies will insist that the dress remain inside a sealed box until the next person goes to wear it. Yet some experts advise against this. They point out that it’s always a good idea to very carefully take your dress out every few years (wearing white gloves to prevent leaving any skin oil stains) and look it over to be sure everything still looks fine. If there are any problems with it, this will allow you to have them addressed right away instead of waiting for another decade or two. If the dress is still okay, then you should carefully repack it and put it back away. How much did you spend on your wedding dress? To some degree what you invested in it will likely affect the price to clean and preserve it, too. That’s because the finer the fabric, the size and the more detailing it has, the more involved the cleaning and preparation technique may be. For instance, if you have a long train, embroidery, crystal beading, lace edging or any other special effects, this will require more effort and expertise. Cleaning silk can also be pricier than other fabrics. And if your dress has stains that will need to taken out, this will require additional labor and will likely make the job more expensive. What part of the country in which live can also affect the price for this service. In large cities such as New York, Boston and Los Angeles, prices will probably be higher than in more rural areas. Very simple gowns can start at about $150 to clean and store, and the price can go up as high as about $800 or more for one of extremely fine fabric and/or that’s quite detailed or elaborate. Most dresses fall somewhere in the middle, costing between $200 and $500 to clean and preserve. If you really want to save your dress but you’ve spent all of your money on the wedding itself, you may want to ask several friends or family members to chip in for this service as your wedding gift. Or, you could consider a Do-It-Yourself option. You’ll still need to have your gown cleaned (which can cost between $50 and $150 or more, depending on the fabric and details involved), then you can it in a cotton sheet and box it yourself or keep it in a cedar chest and hope for the best. Just keep in mind whether you invest in the services of a professional or give it your own efforts, it’s impossible to protect every single gown from discoloring with the passage of time. The good news is down the road, if your daughter or other family member wants to wear your gown and the fabric has yellowed a little, you may be able to have it professionally bleached safely to bring it back to its original glory.